In October 2010, I attended ICMM 2010, the 12th International Conference on Molecule-Based Magnets in Beijing, China. I presented a poster which can be downloaded here. The muon is a uniquely sensitive microscopic probe for studying molecular magnetic systems. 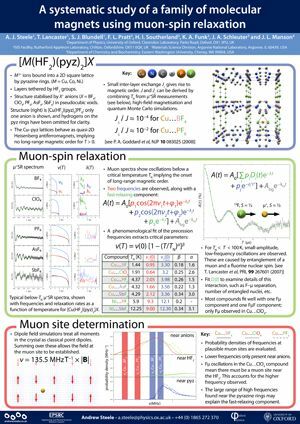 Muon-spin relaxation (µ+SR) allows precise determination of transition temperatures Tc and extraction of critical parameters, where bulk probes such as heat capacity are unable to detect magnetic order. In a systematic analysis of compounds in the family of two-dimensional Heisenberg antiferromagnets M(HF2)(pyz)2X (where pyz = pyrazine, M = Cu, Co, Ni and X = BF4, ClO4, PF6, AsF6, SbF6), trends within the family are identified and these systems are used to explore what further information µ+SR can be used to extract from molecular magnetic samples. In addition to examining critical behaviour, dipole field simulations are used to evaluate the local magnetic field inside the crystals and isolate potential muon sites. These are used in combination with FµF oscillations above Tc, in which quantum entanglement of a muon and a fluorine nuclear spin allows the muon position relative to the fluorine to be established. This allows constraints to be placed on the magnetic structure of these systems.